I love online stores like sheinside.com, but I'm always so nervous to buy online that I rarely do it. I'm always in love with half the stock, so I thought I'd share a small few of my weird and wonderful loves from the sheinside website. After being told Disney World is happening next year, I've been excited to get some cute and funny Disney get-up for the holiday and this tee is first on my list! I think I'm determined to wear something Disney everyday, so if this doesn't fall through I'll be buying lots of funky Disney related tees! I'm also loving cute repeated prints at the moment, and the likes of this daffy co-ord and the cat print dress are appearing in my imaginary shopping basket. I know the daffy co-ord is weird, but I still love it since it's not as OTT as you'd expect something like that. I'd definitely buy it for the price it's at! Of course, this weird girly girl is going to be lusting over some cute floral and pastel pieces too, and recently I've been adoring white and blue dresses. I'd love either of these as a nice going out dress for evening dates or nights out. I'd also love to pick these cute floral high waisted shorts to add to my collection of shorts, because they're longer than the ones I have already as well as being really different too. I really love all these pieces... Someone want to buy me any of these!? Have you shopped sheinside.com? What's your views on them? Oh my gosh these items are absolutely stunning! EEP! I adore that blue / white contrast dress! & the cat tunic! & I agree, cute repeat prints are the best! I want the cat dress!!!!!! 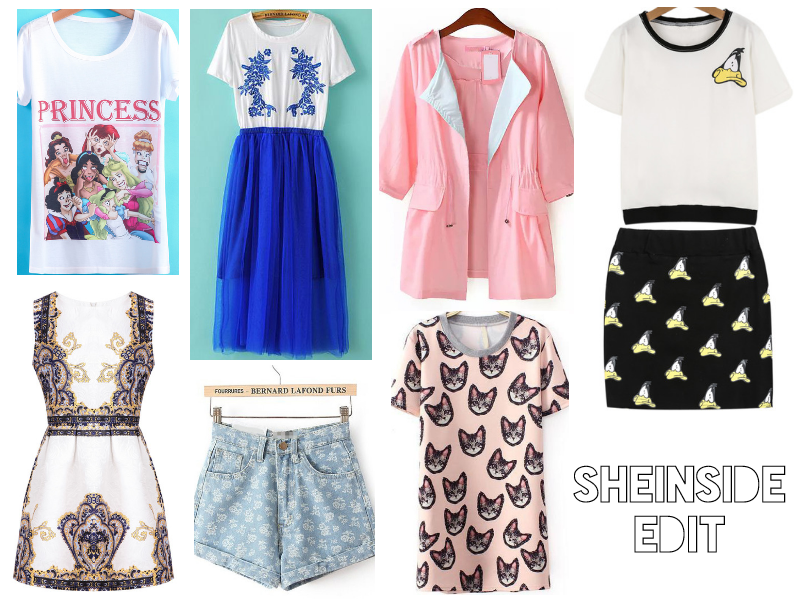 I love Sheinside, great picks lovely! I love the Disney tshirt! Nice selection! i like these shorts!